On Saturday we’ll wake up to a new Premiership season: another eight months of familiarity, strangeness, coziness, cheerlessness, overwhelming wealth and sterility. It’s a nice little analog for life, which is why we keep returning. Everyone feel better? Of course. This Sunday morning I’ll resume my adapted residency at Scallywag’s in Toronto for Liverpool’s opener against Southampton. A thrashing seems in order given Livvie’s plundering of the Saints’ finest assets like vikings at a Christian feast. Along with the football, the game promises a sartorial clash of the hideous (Warrior is at it again) and the nameless (Southampton are MAKING THEIR OWN KITS); an interesting subtext for those of you so inclined. This year’s preview focuses on trends and other curios in Premiership apparel rather than the traditional league-wide round up. Kit suppliers have for the most part issued acceptable offerings for their clients: traditional, conservative, if anything a touch bland. If I’m honest, this column has been harder to write than usual. But as ever, we have Warrior keeping things interesting, and there’s always one club “doing a Bolton” (Hello, Swansea). To this I say: let’s go. Particularly from Puma, who are prominent in the Premiership mix this year (notably stealing Arsenal from Nike) I don’t know how the average pub-going fan is going to manage some of these jerseys with a pudding belly and a pair of trousers. You have to be fitter than the lads themselves to get away with some of these trims. Continue their sartorial sallying of the Premiership with the new Stoke City kit. Not sure where the usual wackiness is with this offering, but give them time. 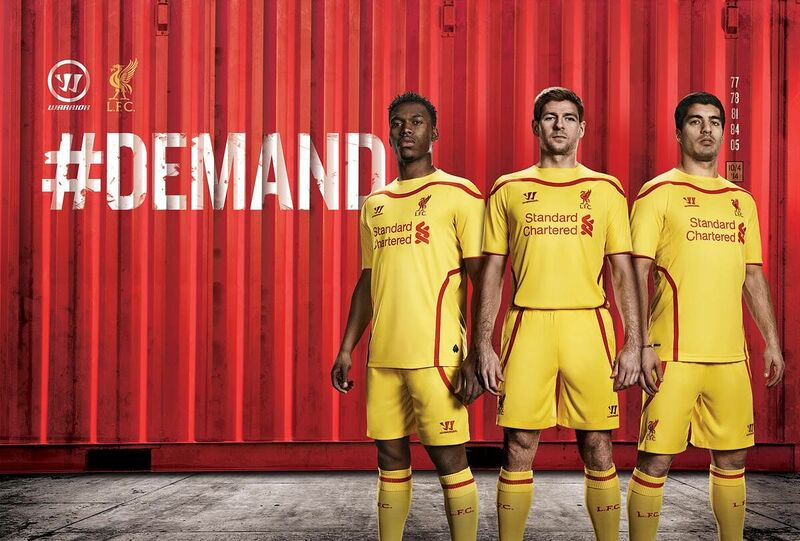 In particular, note the away kit with its modest, complementary colours. But that’s not the issue: there’s just a hint of strangeness on the shoulders, a bit of 1990’s NBA flair that says “this isn’t over yet.” You see, there’s always something with Warrior and, much like Stoke’s relegation chances, it’s lurking just around the corner. After a brilliant first year with Spurs, this year’s offering suggests that someone in the Under Armour design department crushed up Liverpool’s 2012 third kit and snorted it for inspiration. The Spurs designs land at the generous end of just-acceptable, but it’s all getting a bit too yankee-panted for my comfort. Always a nice option, this year the diagonal stripe as credible alternative has become the default. Arsenal rarely find themselves lumped in with Stoke and West Ham, but the notable similarity of these mayoral blue-on-blue offerings leaves me wondering if there’s some sort of speakeasy where these kit suppliers hang out, knock back pink gins and plan Norwegian holidays funded by clandestine Wonga accounts. Has anyone else noticed shirt sponsors getting bigger and finding placement on jerseys with no regard for integration? I’m looking at you on this, Manchester United. Shame on you for letting that garish ‘Chevrolet’ logo sully your otherwise splendid jerseys. 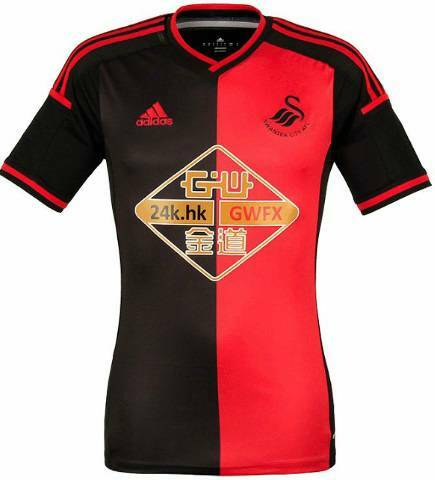 Examples of agreeable sponsor logos arrive with Swansea’s home strip, and Burnley’s sponsor, which I’m guessing provides directions in Simplified Chinese to a JD Wetherspoon’s. Interesting story about Southampton falling out with Adidas over last year’s home kit and then reconciling with the supplier before learning that there wouldn’t be time to create a new kit. 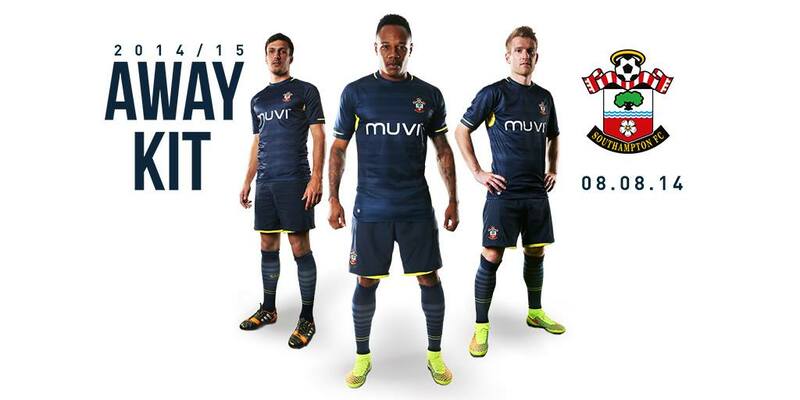 In true DIY spirit, the Saints just went ahead and decided to make their own strip. What? No wonder so many players left over the summer. I wouldn’t want my contract to mandate a two-week stint in Taiwan applying decorative piping to shirt panels, either. 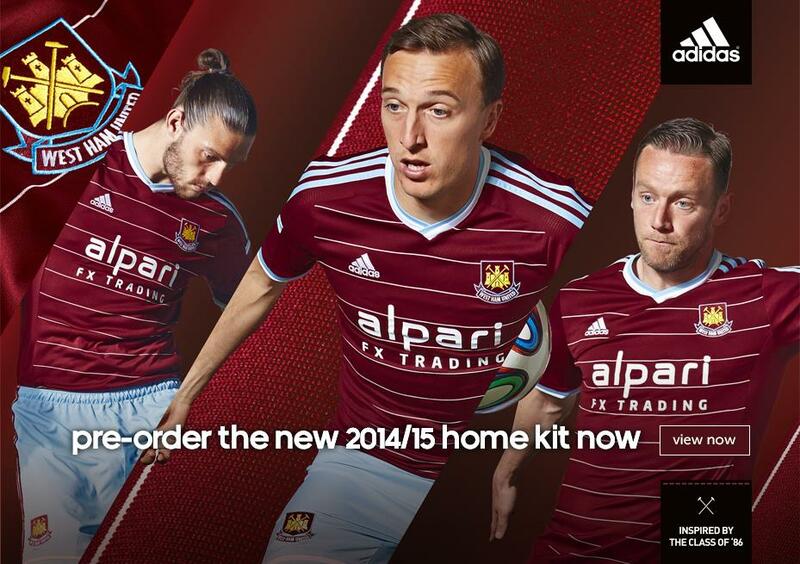 How is it that whoever puts on a West Ham kit immediately looks like they’re from the 60s? 1. Crystal Palace | AWAY→ I’m a sucker for these old time colours, plus the fit on this thing is great. Side note: Tony Pulis, are your standards really that high? 2. Everton | HOME → Reminds of the Toffee’s jerseys when I first started following the English league in the late 80’s. Also, apparently the style of collar used on this jersey is called a Johnny Collar, which is a pretty serious win in my book. 3. 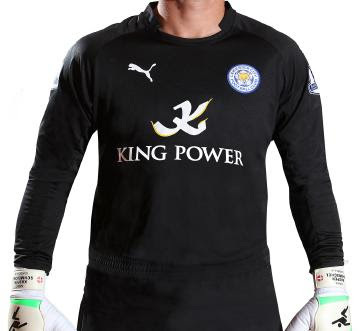 Leicester City GK | HOME → Nice all black job. Plus, Peter Schmeichel named his kid is Kaspar. It must be nice to do whatever the hell you want. 4. QPR | ANY→ Some people might call me out because all three jerseys are basic Nike templates, but I say what’s so wrong with that? They’re clean, simple and classy. Quiz: identify which of these adjectives applies to Joey Barton (Hint: there is only one). 5. Southampton | AWAY → Designed by the club: clean, with a touch of flair via the sublimated horizontal pinstripes. Taken as a whole the strip reminds me of a sweatsuit. Just a big, sweaty suit. Play-in spot: Spurs GK→ Included solely for Hugo Lloris’ expression in the promo photo. Top keeper, and really unbeatable when it comes to the look on the old boat race. West Brom | AWAY → This kit has “1996 travel team” and “Canada” written all over it. Do they still do travel teams? Surely they’re just called “teams” now? Man City | AWAY → Kind of reminds me of a board in the first level of Q-bert, which is pretty wicked, but just not enough, you know? Man Utd | THIRD → Just a bit of uninspired blue nonsense, don’t you think? I’ve never been been a fan of United’s blue change kits, and this one stinks like a wet fart in dry pants. 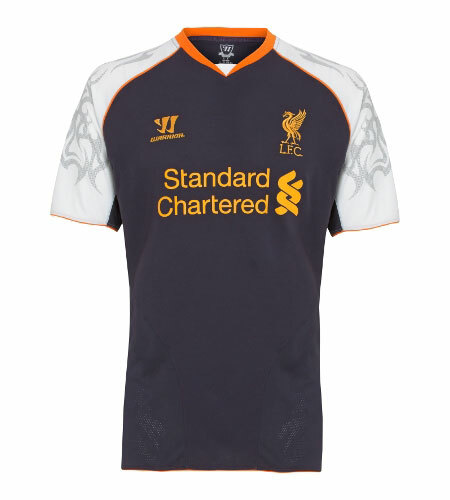 Liverpool | THIRD → This shirt would be pretty decent save for - and there’s alway one little detail with Warrior (or many) - that hateful diagonal stripe that poisons the entire well. 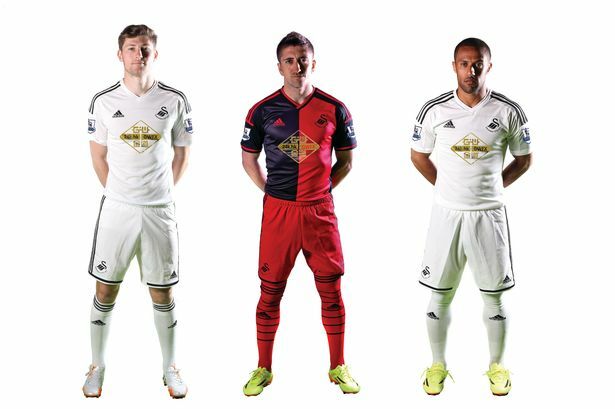 Swansea | AWAY → Maybe when I see this on field it will look more like a football uniform and less like training wear from the Mexican space program. Relegation Battle: Liverpool | AWAY → Looks like what I’d imagine a newborn sees when it opens its eyes for the first time. And it leaves me just as cold.